I agree about letting her shoot a few different guns, but I'm all for a nice steel framed j frame if that works for her. Very simple to load, unload, and shoot. A steel frame with standard 38 specials is pretty mellow as far as recoil. Ditto. This might be the lightest recoiling .38 Special I've ever shot -- and it was cheap, too. (Sadly, I fear that those days are gone.) Might be hard to find in a 3", though. I agree that a J-frame isn't ideal for a new shooter. My wife shot mine once and has no desire to do it again. She much prefers her full size PPQ, but she doesn't carry, so size isn't that much of an issue. Along with the models mentioned, there are also "CT" models that come with Crimson Trace grips from the factory, and of course you could add them to one that you pick up. Mine came with the larger LG-305's, which make it a little easier to shoot than the shorter, boot grip-sized LG-105's. I also painted my front sight. Following another's recommendation, I painted it white first, then orange on top of the white to make it stand out more. That's a good price -- that's about what I paid ten years ago from J&G. Oh well, too good to last, I guess. J frames make outstanding target revolvers, and in .38 will last nearly forever. I carried the Model 10 and Model 64 for quite a while, and am very partial to short barrel j-frames for pocket or ankle carry. A .38 j-frame is an outstanding first handgun for someone to start on, and it's hard to go wrong with one. 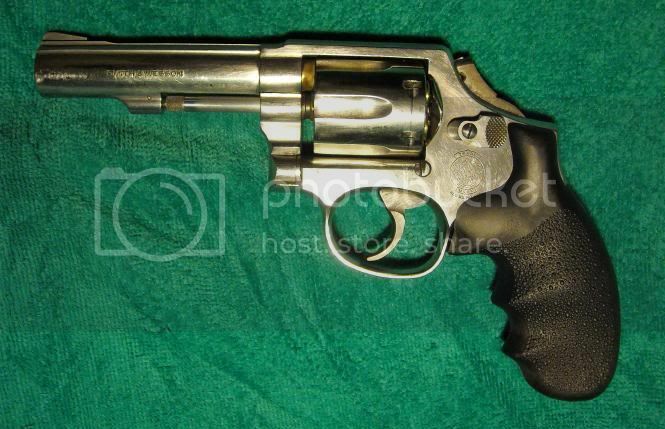 If a snub nosed, full power revolver is strongly desired for SD purposes, then I would also recommend a Ruger SP-101 as a first choice. I have a first gen S&W 640 (+P rated) and the Ruger absorbs recoil better with .357’s than the Smith does with +P’s. I will also add that the LCR in .22LR would be a good starting point for any novice shooter looking to use a snub as their carry choice. After a bit of practice, you can dump 8 rounds of .22 in a small target area with frightening speed. Once the muscle memory is ingrained, recoil in a SP-101 loaded with .38’s would hardly be noticed in a stress situation. Trying to figure out if you have confused J Frames (like the Model 36 and 60) with K Frames (like the Model 10 and 64). I’ve never heard J Frames described as target revolvers before, even though in skilled hands they can be surprisingly accurate. No, you're right, I was thinking k frame for the model 10 and model 64. I have a variety of 642's and other j-frame revolvers, and carry them frequently in the pocket, however, and they're terrific choices for defense as a light, compact, snag-free pistol. I think that even the snobby j-frame gets a bit of a bum rap, as they're quite capable in terms of accuracy. .38 from a stubby is a bit anemic, but also controllable. I carry them with Gold Dot, usually with a couple of speed strips with spares. I have a S&W 637 from their Performance Center with their enhanced action. Great little gun. Yes ... J Frames take some practice to shoot well beyond 15 yards. One can mitigate the short sight radius and improve hitting targets and longer range with a set of Crimson Trace grips. Made a BIG difference for my on my 637. My wife is a petite Filipina just over 5'2" on her first trip to the range last year she picked through most of my handguns and found the ones she wanted to try...she tried my S&W 640 no dash and 642 pro...hated them...loved my Colt Mustang and my H&K USP full size 9mm and my Dan Wesson Valor...she has a strong grip but could not get used to the grip shape on the smiths..both magnas and stock J-frame rubber grips...I would as others have said...find a range with rental guns and let her pick a couple to try..see what fits her hand then see which she can shoot well and likes...rinse and repeat till she finds a good balance of fit and feel and function. I recently took my wife to a range to shoot, trying to find a gun she was comfortable with. I expected her to like the steel Model 36 best. She by far favored the Glock 19. It is now her bedside gun (which is a drag for me because it was my primary off-duty gun). Though I think I will eventually buy her her own G19. If you friend hasn't done so already, I also encourage you to talk him/her into going to a range and shooting/renting several. J-frames shoot-ability all about after-market grips. Hogue and Pachmayr being my favs.